An installed copy of Citrix Receiver. SBUMC VDI (now replaced by MyDesktop) users still running Citrix Online Plugin will need to contact SBUMC IT Help Desk at (631) 444-HELP for assistance removing Citrix Online Plugin. Caution! There is a 30 minute idle timeout. A warning message will appear that time is running out. Be aware that you may be leaving unfinished projects alone too long. You will lose your work! Professors or anyone listed as teaching classes have a 3 hour timeout. If you are logging in for the first time, you will get a prompt to download Citrix Receiver. Please install the client before continuing. Mac users will need to open the DMG file then install the client inside. If you do not want to install software on your computer, you can pick "Use light version"
You can begin by clicking on "Virtual SINC Site Desktop" which will launch a remote Windows desktop session. Or you can go to "Apps" at the top of the page. 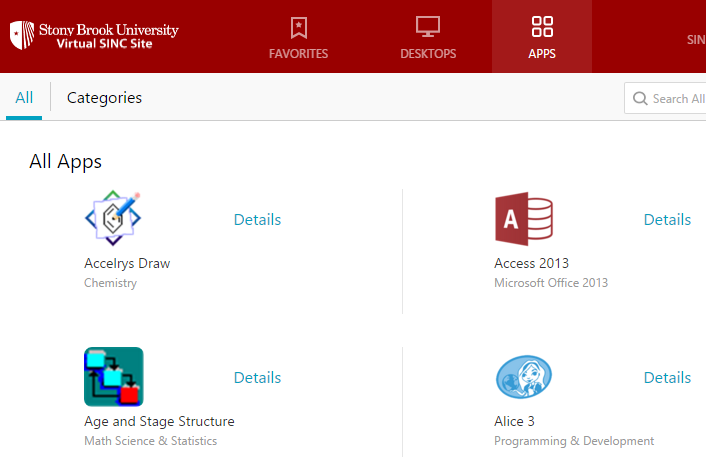 This shows an alphebetical listing of the available apps. However please note that not all are listed. Some apps like Comsol can only be found by lauching the desktop. Selecting "Desktops" brings one back to the "Virtual SINC Site Desktop." Clicking on the app icon whill lauch the app. 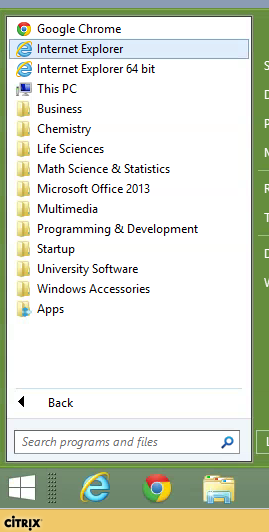 Clicking on "Categories" will show the apps organized into groups and how many apps are within the groups. You can also click on "Apps" to list the applications at once. There are many however! You can also search for an application from the search box in the upper right corner of the page. If you have a set of requently used applications you would like to use, you can add them to your list of Favorites. Clicking on "Details" next to an application will reveal 2 options. You can either "Open" or "Add to Favorites"
Clicking on "Favorites" at the top of the page will show the collection of favorite apps you have compiled together. If you no longer desire to have an app as a Favorite, you can go back to "Details" and select "Remove"
Clicking on these favorite apps will now launch them. 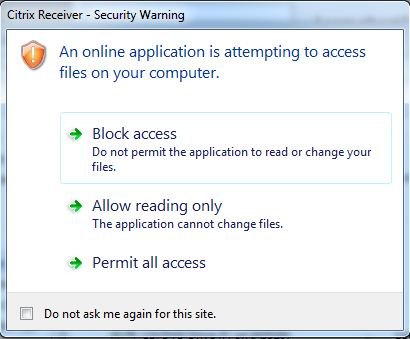 Be careful as they can look identical to an application sitting on your computer! Not all applications are available via the above method for compatibility reasons. Some need to be opened through a full desktop interface instead. 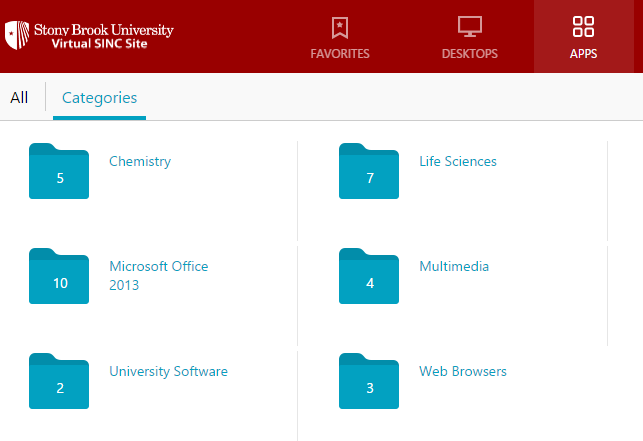 You can find the Virtual SINC Site desktop connection by clicking on the Desktops tab at the top of the page. Once in here, do not attempt to log into the Virtual SINC Site again. This is the Virtual SINC Site with everything shown in a different format. Click on the Start Menu (the Windows logo in the lower left screen of the VSS Desktop Window) to expose the list of apps. The apps are grouped in the apps way as mentioned earlier. The Desktop connection window has a hidden toolbar at the top of it. Click on the small arrow to bring it down. This toolbar a has a few functions. Not all should be used. The "Home" button can be used to minimize the window to focus on something on your local PC. "Ctrl+Alt+Del" can be used to logoff and end your session or to change your NetID password. "Preferences" is used for toggling some features which you'll be nagged about as you progress. "Full Screen" is you want to view the window to fit your whole monitor screen or back to a window. "Disconnect" does not end your session. You can use this as a temporary thing if you want to swtich to another computer. DO NOT use Disconnect if you're done with your project. Log off when you're done. By default all properly saved files are created in your MySBFiles drive. 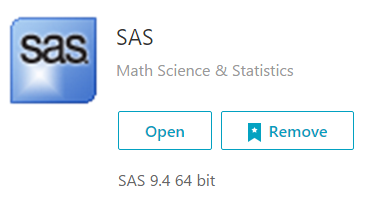 If you are not sure, in the application your using, click on File then in the drop down menu select Save As and make sure you are in the Documents library. When begining a session, you may be warned about file access. If you want to upload/download files then select "Permit all access." You'll be asked again if you don't check on "Don't ask me again for this site." Within a VSS session as you open, save or create a file, you will see a list of drives named A through Z plus the name of your computer. These are your Hard Drives, Optical and USB Flash Drives, etc. you may have connected directly to your computer at the current time. You may also plug in a Flash Drive at a later time and it will automatically be mounted in your session. An example below is using Endnote X7 and a person's computer called "IA5520." 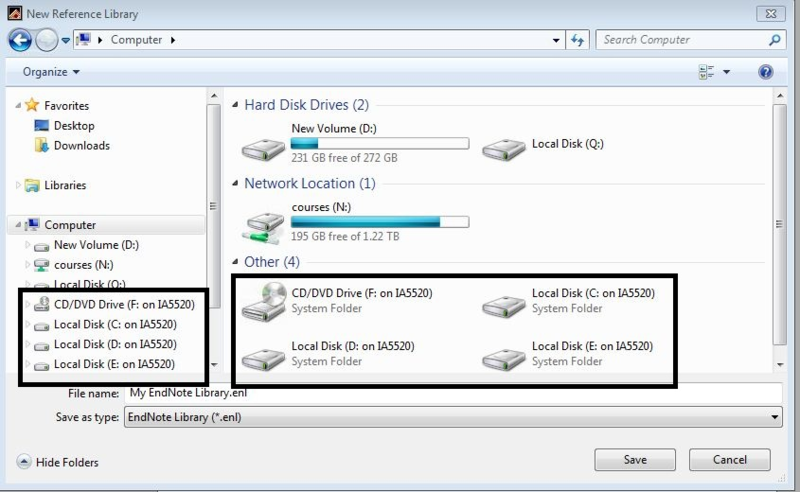 You'll see your storage device in just about all parts of the Virtual SINC Site. Your locally connected printer is loaded as your default printer within the Virtual SINC Site. This behaves in very much the same way as on your computer. Print From Anywhere is also available as a service within the Virtual SINC Site. In a remote application, click File, then Print and select “SINC Print From Anywhere Queue” and print your documents. The Print From Anywhere print queue may be set as the default printer for your session. You may not always get your local printer to mount in the Virtual SINC Site. If your local printer does show in the Virtual SINC Site, you may have to manually select it to print. Check before printing your project. Close your opened apps. For the full desktop however, log off as you would with a typical Windows PC. Logoff the Virtual SINC Site portal page by clicking on your name at the top of the page and select "Log Off" in the drop down menu.